The Best Way to Give Your Body a Fresh Start... in Just 5 Days! Fasting provides an efficient way to cleanse the body and rest the digestive system. Fasting can help support the removal of toxins, improve digestive function and boost feelings of energy. 5-Day Fast & Cleanse is a simple program to help renew and nourish your body, giving you a fresh start. It provides 5 products to support your body during a fasting regimen. This 5-day program helps support the body's natural ability to eliminate toxins through the digestive tract and promote cellular health. 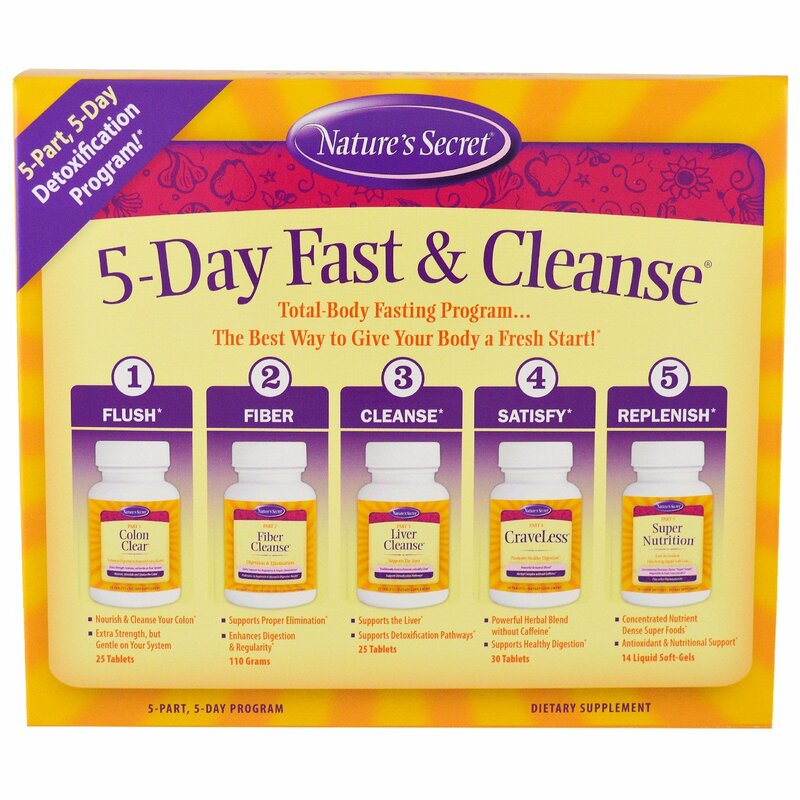 The 5-Day Fast & Cleanse program delivers a bold combination of nutrients and cleansing herbs to encourage healthy elimination of toxins from the colon. The conventional approach to health sees the body as a set of separate parts, each needing their own separate treatments. Take a look at the way our medical system is organized - from cardiologists to dermatologists, we have a doctor for nearly every body part. But nature has a well-kept secret... there is no separation between any of our systems. They are all intricately connected in a brilliant dance only nature could orchestrate. At Nature's Secret, we develop our products using this whole-body philosophy. Please read and follow the enclosed Cleansing Program Insert to achieve maximum effects and personalized dosage. Note: The 5-Day Fast & Cleanse Kit includes additional Colon Clear tablets. If you have not achieved 2-3 bowel movements by following the directions for Colon Clear, increase intake of Color Clear by one (1) tablet every other day until 2-3 bowel movements are achieved daily. Do not exceed six (6) Colon Clear tablets per day. 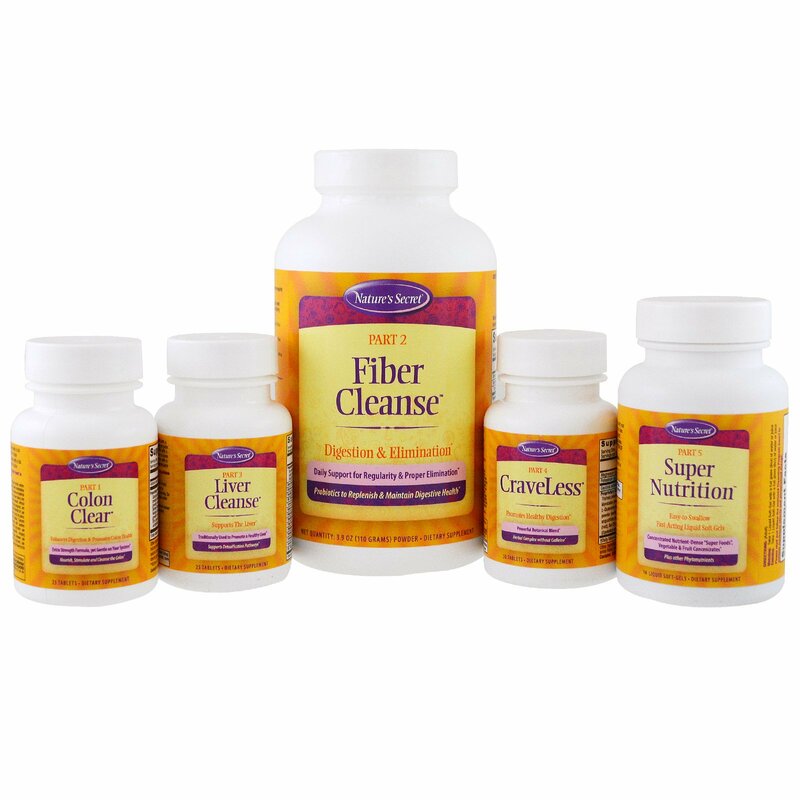 The 5-Day Fast & Cleanse can be used effectively for general cleansing and well-being once every three months for 5 days. Take this product with a full glass (8 oz) of water or juice. Taking this product without adequate water may cause choking. Stearic aicd, hydroxypropyl cellulose, microcrystalline cellulose, silicon dioxide, croscarmellose sodium, natural anise flavor, methylcellulose, magnesium stearate, sodium starch glycolate, soy polysaccharides and glycerin. 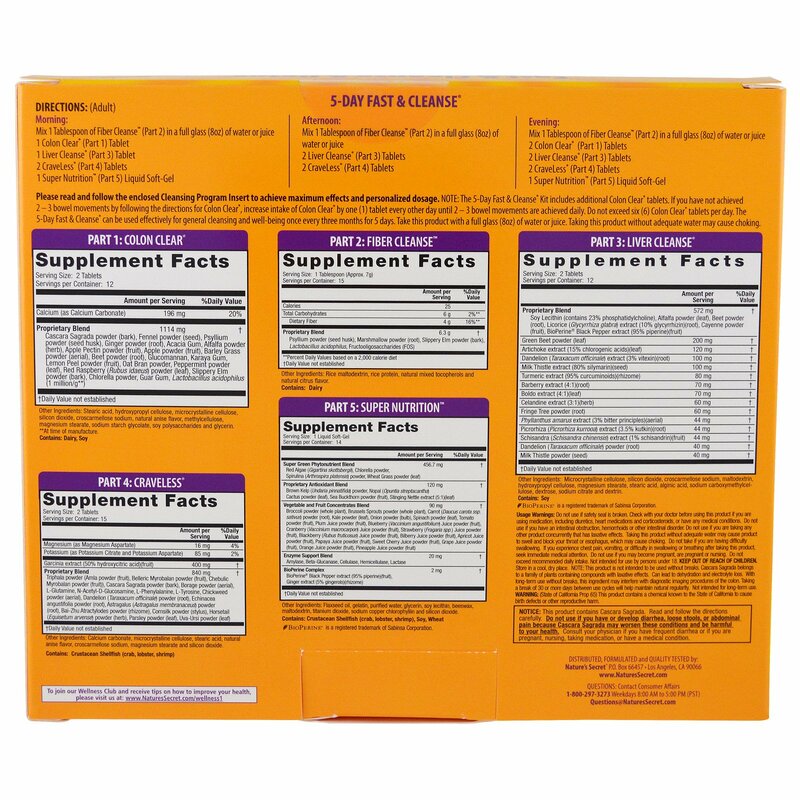 Rice maltodextrin, rice protein, natural mixed tocopherols and natural citrus flavor. Microcrystalline cellulose, silicon dioxide, croscarmellose sodium, maltodextrin, hydroxypropyl cellulose, magnesium stearate, stearic acid, alginic acid, sodium carboxymethylcellulose, dextrose, sodium citrate and dextrin. Calcium carbonate, microcrystalline cellulose, stearic acid, natural anise flavor, croscarmellose sodium, magnesium stearate and silicon dioxide. Flaxseed oil, gelatin, purified water, glycerin, soy lecithin, beeswax, maltodextrin, titanium dioxide, sodium copper chlorophyllin and silicon dioxide. Contains: Crustacean shellfish (crab, lobster, shrimp), soy, wheat. Do not use if safety seal is broken. Check with your doctor before using this product if you are using medication, including diuretics, heart medications and corticosteroids, or have any medical conditions. Do not use if you have an intestinal obstruction, hemorrhoids or other intestinal disorder. Do not use if you are taking any other product concurrently that has laxative effects. Taking this product without adequate water may cause product to swell and block your throat or esophagus, which may cause choking. Do not take if you are having difficulty in swallowing. If you experience chest pain, vomiting, or difficulty in swallowing or breathing after taking this product, seek immediate medical attention. Do not use if you may become pregnant, are pregnant or nursing. Do not exceed recommended daily intake. Not intended for use by persons under 18. Keep out of reach of children. Store in a cool, dry place. Note: This product is not intended to be used without breaks. Cascara Sagrada belongs to a family of plants containing compounds with laxative effects. Can lead to dehydration and electrolyte loss. With long-term use without breaks, this ingredient may interfere with diagnostic imaging procedures of the colon. Taking a break of 30 or more days between use cycles will help maintain natural regularity. Not intended for long-term use.